"Delicious with coffee, or as a nice compliment to any brunch casserole." Preheat oven to 375 degrees F (190 degrees C). Grease and flour a 9x13 inch baking pan. Cream together the white sugar and shortening. Beat in eggs one at a time. Stir in half and half. In a separate bowl, sift together 1 1/2 cups flour, baking powder and salt. Stir flour mixture into cream/egg mixture. 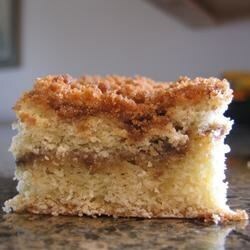 In a small bowl, stir together brown sugar, 2 tablespoons flour, cinnamon and walnuts. Stir in melted butter. Spread half of the cake batter in bottom of prepared pan. Sprinkle half of the streusel mixture over the batter. Spread the other half of the batter over the streusel mixture and top off with the rest of the streusel mixture. Bake in preheated oven for 25 to 35 minutes, until a toothpick inserted into center of the cake comes out clean.